Even thousands of years ago, written messages were sent over long distances. Unfortunately, the concept of including your return address hadn't been invented yet, so we don't know where ancient letters came from (and which cultures were talking)...until now. Professor Yuval Goren, an archaeologist at Israel's Tel Aviv University, has modified a standard portable X-ray scanner to determine the secret origins of ancient letters. At its most basic, the scanner can determine the soil and clay composition of any artifact. Since different regions at different times have different mixes of soil and clay, this allows Professor Goren to place the exact origin of the artifact - which is particularly useful when it's the sort of artifact that travels far away, like a letter from one ancient king to another. He is also able to draw upon years of painstaking sampling of various Near East artifacts to build a database of different soil compositions throughout the ancient world. By uploading this data into his scanner, Goren can provide an instant date and place of origin for any artifact he scans. It will work on other traveling artifacts like coins, Goren says, as well as potentially imported materials like ancient plaster and glass. "It's become a big ethical question. Many museums will not allow any more physical sampling of artifacts, and it's especially problematic for small tablet fragments and stamps which cannot be broken in the process. I had to find another way to know what these artifacts were made of." In a recent demonstration of his scanner's abilities, Professor Goren and his fellow archaeologists studied a letter that had been sent to an Egyptian pharaoh some 3,500 years ago. 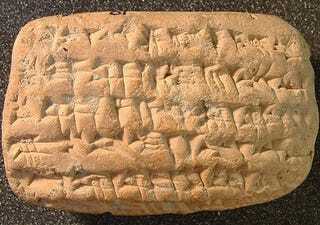 The letter was written in the Akkadian language and discovered in Jerusalem. The scanner confirmed the letter's raw material came from soils around Jerusalem, and they were able to narrow down its date of creation to a specific ruler - they're fairly sure this is an archival copy of a letter the Jesubite king Abdi-Heba sent to the pharaoh.